A new affordable housing complex in Goleta built by nonprofit housing developer Peoples' Self-Help Housing is fully occupied and has received its grand opening. 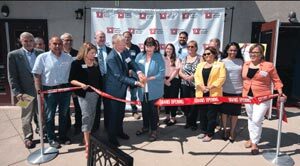 In a ribbon-cutting ceremony Wednesday morning, the new development Casa de Los Carneros was publicly unveiled as the affordable housing facility of The Village at Los Carneros. PSHH executive vice president and CEO Ken Trigueiro told the News-Press that nearby residents have been very welcoming to the new building and that the city's leaders were helpful in getting it built. According to Mr. Trigueiro, construction of Casa de Los Carneros was initially spurred on by a City of Goleta ordinance demanding more affordable housing. To achieve this goal, the City chose PSHH to develop the project. The development was completed after sixteen months of construction. According to Mr. Trigueiro, Casa de Los Carneros, like all of the units PSHH has built in its inventory of approximately 50 local properties, are defined as affordable housing. The nonprofit's definition means specifically for people who earn 60 percent or below the area's medium income. Casa de Los Carneros tenant Karina Martinez told the News-Press that the new accommodations have made life far more comfortable for her, her husband, and three kids. Ms. Martinez and her family formerly lived in a two-bedroom house with an additional roommate. When she heard about a raffle for one of the 70 new units in October, she wasted no time in submitting her name. After getting chosen, she and her family moved into the complex in May. "It has changed our life. We are in a three bedroom apartment, my kid's are really excited, we are more comfortable, and we have two bathrooms. My kids are really motivated by the after-school program in the learning center," she said. An after-school learning center on the ground floor is among the complex's various amenities, which includes a community garden, playground, and basketball court. PSHH director of communications and resource development Gillian Cole-Andrews told the News-Press that the learning center's teachers educate 300 students between kindergarten and eighth grade in its after school program. The room also hosts a college club for its college-bound residents and summer programs when school is out of session. Ms. Cole-Andrews described the tenants' reception of the learning center as "unbelievable." "Whenever we open one of these centers, immediately and unfortunately we're generating a waiting list," she said. She added that the learning center particularly stresses mathematics and literacy, something very much needed as all the building's kids are economically disadvantaged and many are English language learners. "When you look at that demographic, the rate for children reading on grade or on math competency is absolutely dismal," she said. After showing the News-Press the learning center, Ms. Cole-Andrews gave a tour of one of the building's apartments, which featured hardwood floors, a kitchen with a dishwasher, and a view of the complex's courtyard. As for how much an apartment costs to rent, Ms. Cole-Andrews said that there is no fixed price. Reflecting the local government's desire that its citizens not spend more than 30 percent of their salary on housing, Casa de Los Carneros charges 30 percent of whatever a tenant's income may be. "Every resident will in theory will pay a different amount," she said. Though the affordable prices will most likely improve residents' financial capacity and self-sufficiency, Ms. Cole-Andrews anticipated that the residents at Casa de Los Carneros will remain there for a long time. "Once you leave our housing, there isn't a great deal of housing somebody can afford afterwards," she said.